BRADFORD ENTREPRENEUR Eric Hawthorn has helped launch a new support service which aims to help 20,000 ambitious small and medium firms over the next six years. 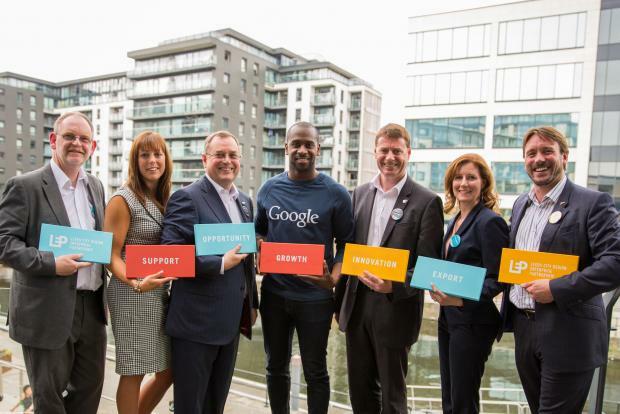 From left, Tim Parkinson, Airedale Springs; Victoria Boldison, Principle Healthcare; Roger Marsh, LEP chairman; Gori Yahaya, Google; Eric Hawthorn, Radio Design; Melanie Oldham, Bob’s Business and Adam Beaumont, aql. The LEP is providing a single point of contact to help SMEs find the right support to achieve their growth ambitions in areas including business finance, exporting, innovation and skills including leadership and management. Roger Marsh, LEP chairman, said: “Helping business and enterprise to thrive is at the heart of our long-term plan to transform the Leeds City Region economy. SMEs make up 99 per cent of our business community: if they grow, our region will grow too. Other local business leaders taking part in the launch included Tim Parkinson, Chairman of Airedale Springs in Haworth and Victoria Boldison, international brand controller at Skipton-based Principle Healthcare.